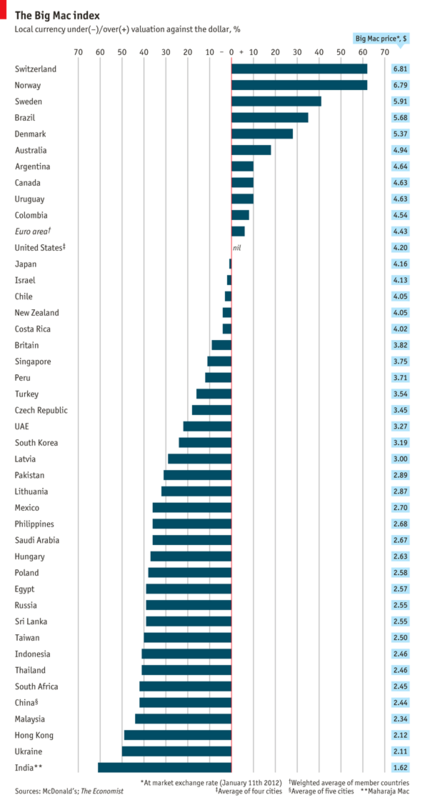 The Big Mac Index is published by the Economist to compare the currencies of different countries and to evaluate whether a particular currency is overvaluated or undervaluated. It does so by looking at the price of a Big Mac burger, which is available in more than 100 countries with an identical recipe. Thus, a Big Mac in the U.S. costs $4.07 whereas in China it costs $2.27, using nominal exchange rates. From this, the index suggests that the Chinese yuan is 44% undervalued versus the U.S. dollar, otherwise the price of a Big Mac would be the same. This is a simplistic way to demonstrate purchasing power parity, a theory that says that the exchange rate between two countries should move toward “correct” value, which would make the price of a basket of products the same in both countries. But despite being a crude measure, many economists and market pundits pay attention to the Big Mac index — including the Reserve Bank of India. According to this index, the Swiss Franc and the Norwegian Krone are both more than 60 percent overvalued compared to the US dollar. Much further down are Sweden with over 40% overvaluation and Brazil which shows more than 30%. The flip side comes with the Indian Rupee, which had been hitting record lows last year. Here, we’re talking about a 60% undervaluation. Ukraine, Hong Kong and Malaysia come close at over 40% undervaluation. If you wondering China’s Yuan is the 5th most undervalued currency using this statistic, also more than 40% undervalued vis-a-vis the US dollar. It should be noted that out of 10 undervaluater currencies 8 are Asian currencies. THE ECONOMIST’s Big Mac index is based on the theory of purchasing-power parity: in the long run, exchange rates should adjust to equal the price of a basket of goods and services in different countries. This particular basket holds a McDonald’s Big Mac, whose price around the world we compared with its American average of $4.20. According to burgernomics the Swiss franc is a meaty 62% overvalued. The exchange rate that would equalise the price of a Swiss Big Mac with an American one is SFr1.55 to the dollar; the actual exchange rate is only 0.96. 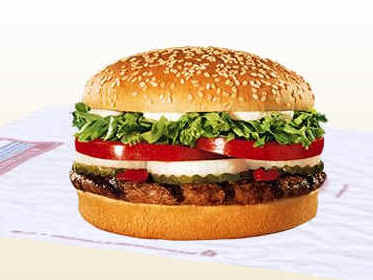 The cheapest burger is found in India, costing just $1.62. Though because Big Macs are not sold in India, we take the price of a Maharaja Mac, which is made with chicken instead of beef. Nonetheless, our index suggests the rupee is 60% undercooked.